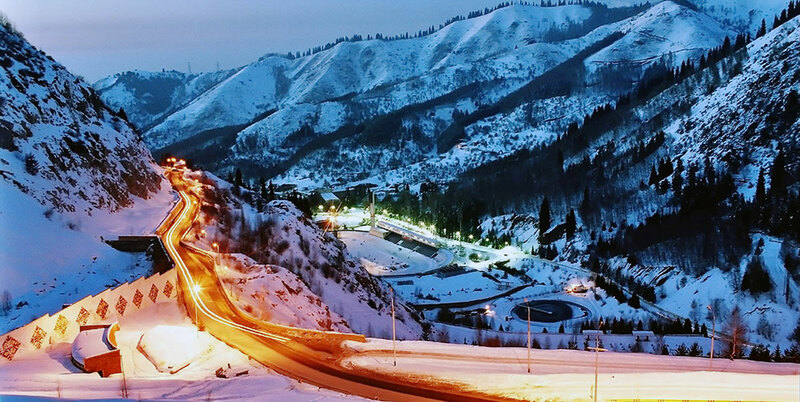 What you need to know about Almaty at the first visit. In this article I will address practical issues, in my opinion, are important for foreigners who are going to visit for the first time a new city in a new country. These are transport, accommodation and meals. At the end I will tell a little about leisure activities. First of all, I recommend next websites where you can find detailed Almaty’s map. 2gis.com – in my opinion, this resource contains the most detailed 3D map of the city, also at the map you can find locations of needed places, like bus stops, cafes, exhibitions, money exchange points and many other places. If you need to look panoramic pictures of some street or satellite images, I recommend maps.yandex.com. For those, who are accustomed to maps.google.com can use this service, but the map is less detailed. Let's start with exchange rates. In Kazakhstan, you can exchange currency in banks and in special money exchange points. Exchange rate is approximately the same everywhere. Often small exchange points give the best price. There are no problems with the exchange of US dollars, GBP, Rubles, Chinese yuans or Euros in Almaty. Of the major networks of exchange points I can identify MiG (МиГ). If you want to test the adequacy of the exchange rate, you can look other offers by visiting kurs.kz. The website is only in Russian, so use Google's free online language translation service. There is one airport, two railway stations, one a local bus station and an international bus station. All objects are located within the city limits. You can reach the city center from the airport by bus, see 2GIS map to find the nearest bus stop and bus route. Public transport fare is 80 KZT (0.3$) when you pay by transport card Onay or by SMS, in case of cash payment, the travel will cost 150 KZT (0.5$), at the date of publication of the article USD/KZT exchange rate was 340 KZT for 1 US dollar, also you can take Taxi, it will cost you 1700 – 3400 KZT (5-10$). There was night bus route №3 from the airport fare was 200 KZT (0.6$) and at the beginning of the year from the airport to hotels in the city was launched the Shuttle Bus, cost 500 KZT (1.5$) per person. Near the airport you can find private cabs, I should warn they quite arrogantly imposed their services, if price is good you can use them right at your own risk. The following are the names of some of the city taxi services. Eco Taxi, AlloTaxi (АллоТакси), Lider Taxi (Лидер Такси), Econom Taxi, also in Almaty you can find next online taxi services inDriver, Yandex Taxi and Uber. Actually in Almaty a lot of private taxi drivers, who don’t have any license and don’t pay any taxes. If you want to catch a ride you need to stand on the side of the road and pull the hand, after you need to discuss destination and payment, however at night or in bad weather to do this can be problematic. The taxi fare in the city is averagely from 500 to 1000 KZT (1.5 – 3$). The next type of public transport you can find in Almaty – buses, trolleybuses and subway, unfortunately tram depot was closed but the city authorities promise to run the Light Rail Service. Subway is not highly developed in terms of the capture of the city, in terms of cleanliness and conveniences it is at rather high level. Metro connects almost two ends of the city and runs through the center, which is very convenient if you live near the station. Trolleybuses are full municipal they are in trust management of the company GREEN BUS. Buses are partially municipal and partly private. I recommend to install the app CityBus which help you to track the movement of buses and trolleybuses. 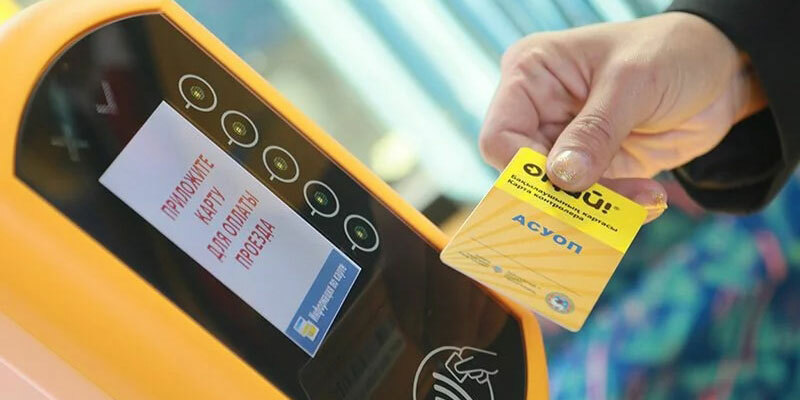 From January, 2016, for travel on all public transport, you need to have unified transport card of Onay, official website onay.kz, the cost of the card 400 KZT (1.2$), the fare of one direction travel is 80 KZT (0.4$). You can buy the card at newsstands near the stops, metro ticket offices and reportedly at the airport, if you do not have Onay card the fare can be paid in cash to the driver, they often do not give tickets, so I recommend asking for a ticket after payment. In the subway, in addition to Onay also has its own card, valid only in the subway and one-time tokens. Using public transport is not very convenient, except the subway, because many drivers of buses and trolleybuses don’t drive very carefully and sometimes long stand at bus stops, city officials are trying to deal with it. Drivers of private bus routes usually drive even worse. Also, the city has carsharing company Doscar club and automatic bike rental stations Almaty Bike. In Almaty, you can stay in a hotel, hostel or rent an apartment. Hotels in Almaty have different price ranges, I do not advise the cheap one, in my opinion, better to stay in a hostel, or rent an apartment, I think service and comfort will not please you. From expensive hotels is possible to note the hotel Kazakhstan, one of the symbols of the city, Ritz-Carlton Hotel Almaty, Hotel Royal Tulip Almaty, Hotel Rixos Almaty, hotel InterContinental Almaty, Rahat Palace Hotel and Hotel Holiday Inn Almaty. They are quite expensive hotels. Accommodation prices start from about 33 000 KZT (100$) per day. Use booking.com for booking a room, viewing accommodation options and looking rates. If you decided to rent an apartment, here prices start at about 3 000 KZT (9$) per day. Good options approximately 6 000 KZT (18$). For booking an apartment I recommend to use the website airbnb.com, so you can avoid fraud. Just see prices and owner’s phone number, without the possibility of booking, you can at the local website krisha.kz, it is only in Russian. In city, you will find many places where you can eat, from expensive restaurants to relatively cheap eateries. If you want to try the national cuisine, you may visit the restaurant «Zhety Kazyna» (Жеты Казына) or «ZOLOTO», in addition to the food here you will find the national color, the average check per person comes out to about 10 000 KZT (30$). Of course there are plenty of cafes where you can try the national cuisine at more affordable prices, such as halal cafe «Tarim» (Тарым), the average check in the cafe for one person will be equal to 2 000 – 3 000 KZT (5$) or network of cafe «Paradise». Also you can find restaurants providing cuisine of all post-Soviet countries, Russia, Georgia and other, as well as traditional sushi bars, pizzerias, fast food and cheap eateries. The most widely represented network of eateries is «Kaganat» (Каганат), here you can eat tasty and not expensive. Speaking about the international networks of fast food, the following brands are present in Almaty McDonald's, Burger King, Hardee's, KFC. Usually fast food restaurants are located in major malls. Get acquainted with the restaurants of Almaty, you can use the services tripadvisor.com, restoran.kz, wikicity.kz. For order ready meals use online service chocofood.kz, website in Russian. For those who prefer to cook themselves, the problem with the purchase of products does not arise. You will easily find private small shops, supermarkets and hypermarkets. From large supermarket chains I can allocate Ramstore (Рамстор), Magnum (Магнум), Realist (Реалист), GREEN, Metro and newly opened in Almaty Carrefour, you can find luxury products in elite store Esentai Gourmet. If you are going to visit Almaty in the summer or early autumn, it makes sense to buy the products at bazaars (markets). Since the city is located in the south of the country, in the summer and early autumn you can buy cheap and fresh fruits and vegetables. For example, water-melons in season are cost about 60 KZT (0.2 $) per kg. 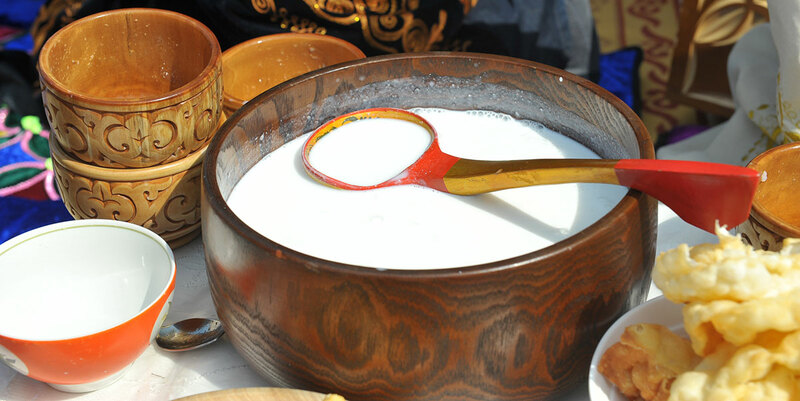 Also I recommend trying the national milk drinks, kumys (кумыс) – fermented mare milk and shubat (шубат) – fermented camel milk. Kumys has quite specific taste to which you need to get used to and it has a small degree of alcohol, shubat has soft tender taste and I think it will please you. If you are not vegetarian try dietetic horse meat and kazy (казы) – national sausage. I recommend café «Alina» (Алина) there you can try gorgeous horse steak. Also try the taste of oriental dried fruit, dried apricots and raisins. Of the major bazaars (markets) I recommend to visit the Green Bazaar (Зеленый базар) – Central Farmers Market. If you will be staying close to the market Sary–Arka (Сары–Арка) I recommend buying food there. There is also a large market Altyn–Orda (Алтын–Орда), but it isn’t very convenient place, a lot of people, not very clean and long road. Order online products segment is not well developed, the following websites offer this service arbuz.kz, onlinefood.kz, domosed.kz, also there you can purchase of farm products aulberekesi.kz, all the sites are in Russian. As I mentioned above, in Almaty a lot of bars, cafes and nightclubs. Popular youth bars are Kvartira bar (Квартира бар), a network of bars Pinta (Пинта), a network of bars Chechil (Чечил), a network of bars Chestni (Честный), Barvikha bar (Барвиха бар), bar Sosedi (бар соседи), Chukotka (Чукотка), Banka (Банка) bar. Long time ago I watched a TV program with Ewan McGregor, in which he visited the Almaty public bathhouse Arasan (Арасан ) and said that it is the Almaty’s main spa. It is certainly a little bit wrong, but Arasan really the oldest public bathhouse in Almaty, recently it has upgraded, I think, the service is in a good level, so fans of banya or sauna can visit this place. 2 hours is worth about 4 000 KZT (12$), beer 600 KZT (1.8$) for a mug. You can try Tau Spa Centre (Тау Спа), this place is located in the mountains, there are outdoor heated pools in which nice to swim in the winter. In general mountains is the main holiday destination of Almaty residents in winter and summer, if you will come in the winter, I recommend to visit the ice-skating rink Medeu (Медеу), the highest skating rink in the world, entry per person is about 1 800 KZT (5$), rental of skates is approximately 1 000 KZT (3$) on hour. If you ski or snowboard you should visit one of the ski resorts, the main are Chimbulak (Чимбулак) ticket on the day will cost you about 8 000 KZT (25$), Tabagan (Табаган) and Akbulak (Акбулак). The last two are at a small distance from the city and the prices are a little lower. If you like skiing you can visit the ski resorts of the neighboring Kyrgyzstan, prices are even lower. In the late autumn, in winter and in early spring, you can go to the hot springs in Chungju (Чунджа), which is about 250 km (155 miles) from Almaty, there are different hostels with different conditions and indoor and outdoor pools, I think most are not more than 3 stars, but water is really good, the average daily rate without food is 6 000 KZT (18$), three meals a day will cost you 3 000 KZT (9$). Also in the city you can improve your health in health resorts such as sanatorium Alatau (Алатау), Coctem (Коктем) and Almaty (Алматы), average cost per person and per day 25 000 KZT (75$). Weekends in the summer, many Almaty citizens are spending on the shore of the reservoir Kapchagai, here you can find guesthouses with different prices. The city Kapchagay is the official games area with casinos and gaming halls. Also in the sumer you can visit Big Almaty Lake (Большое Алматинское Озеро), the Charyn Canyon (Чарынский каньон), singing dunes (поющие барханы), tract Cok–Zhailau (урочище Кок–Жайлау), Turgen waterfalls (Тургеньские водопады), Kolsai Lakes (Кольсайские озера), as well as, in my opinion, one of the most beautiful places near Almaty Lake Kaindy (озеро Каинды). At a distance of 620 km from Almaty is a lake Alakol, water in the lake is considered to be therapeutic, the entire coast is volcanic pebbles. Once again in neighboring Kyrgyzstan you will find popular among the residents of nearby countries Mountain Lake Issyk–Kul (Иссык-Куль), with clear water and developed infrastructure. If you prefer a cultural program, in Almaty you will find Central State Museum of Kazakhstan, Republican Museum of Fine Arts named after A.Kasteev, State Academic Opera and Ballet Theatre named after Abay, Kazakh State Academic Drama Theater named after M.O.Auezov, State Academic Russian Drama Theatre named after M.U.Lermontov, Academic Theatre for Children and Youth named after G.Musrepov, State Academic Russian Theatre for Children and Youth named after Natalia Sats and other.